bombarded plutonium-239 dioxide with neutrons. after dissolving the bombarded plutonium dioxide in acids. that the team called them pandemonium and delirium. that beeps when smoke enters the chamber. Our glacial soils don’t emit radon. except for the americium-241 in smoke detectors. Americium, accent on the third syllable, with the “c” pronounced softly as an “s” or “sh,” is bioaccumulative and harmful to life. 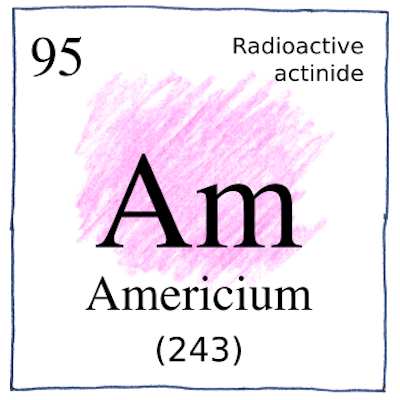 Americium-241 is fissile and more radioactive than plutonium-239; however, it a small amount of it is an essential component in common smoke detectors.